If you are missing one or many teeth, then you may know that you have a choice when it comes to replacement. You could decide on a bridge, dentures or dental implants. Naturally, the cost will depend on the type of replacement selected, so cost is usually a factor to consider. The periodontists in our office want you to know that while dental implants may cost a bit more up front, they can actually end up being more economical in the long run. Read on to learn more about the cost of dental implants in Worcester. 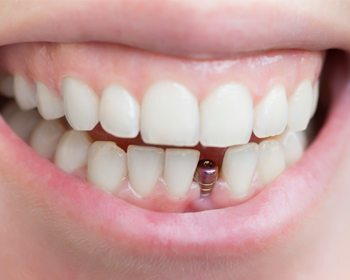 Single Tooth Implant. For patients missing one tooth, a single tooth implant could be an ideal solution. One titanium post is placed beneath the open socket. Once you’ve healed and the post is secure, a dental crown is attached. Implant-Supported Fixed Bridge. If you are missing two or more teeth consecutively, then an implant-supported fixed bridge may be recommended. Two dental implants are surgically embedded to hold a row of replacement teeth. You may need up to four dental implants to support a partial denture. Full Denture. Dental implants can also be used to secure a set of full dentures along your top or bottom arch. A full denture often needs four to six implants in order to remain firmly held in place. What Are the Stages of Dental Implant Placement? First, the dental implant is surgically positioned in your jawbone to stand in for the missing tooth root. As you heal from surgery, the implant and surrounding bone fuse together. This process, called osseointegration, usually takes between three to six months. Next an abutment is attached to the implant. 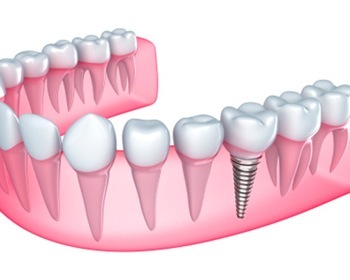 The abutment connects the implant to your prosthetic tooth and helps to make sure the implant remains embedded in bone. Once the implant and abutment are completely secure, the prosthetic tooth is attached to the abutment, and your smile is complete. Consider this: denture wearers will need to repair dentures over time, and eventually replacement will be necessary. That’s because they rest on top of the gum ridge, which changes shape as you age. Dental implants, however, can last for decades. In fact, dental implants have been known to last a lifetime among patients that maintain good oral hygiene and schedule checkups regularly. 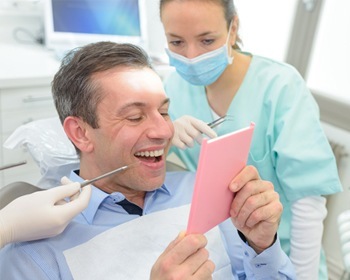 Therefore, the cost of dental implants could be less over the long-term when compared to other types of prosthetics that require maintenance and replacement. As dental implants become more common for tooth replacement, dental insurance companies are beginning to offer some coverage. Also, other components of the dental implant process may be covered, such as the cost of the restoration or any preparatory work including tooth extraction or bone grafting.